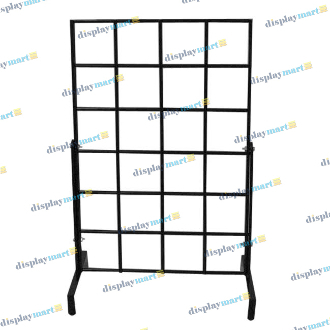 The DisplayMart.com counter top grid display is the ideal merchandiser for the top of any checkout counter or display case. Designed by using a single piece of 12" by 18" grid panel, this display has all double wire edges allowing it to be displayed horizontally or vertically! Available in both black and white finishes, this easy to use display is designed to attract customers to impulse buys upon checkout! Use with the grid hooks and accessories of your choice also found on DisplayMart.com.